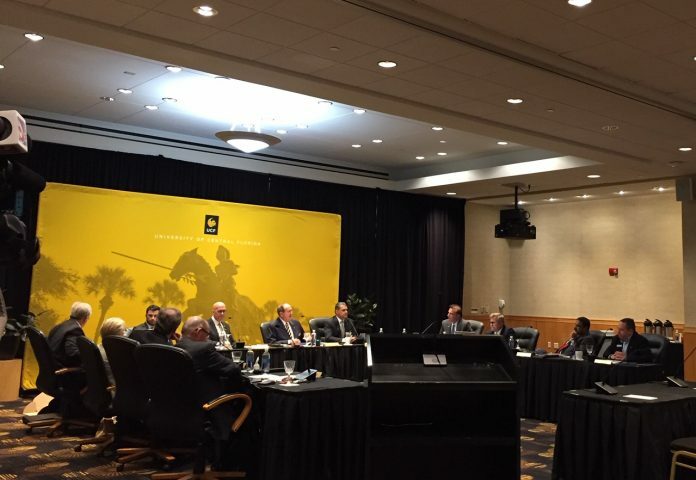 UCF Board of Trustees decide unanimously for Thad Seymour to lead until a new president is chosen, during the BOT meeting in the FAIRWINDS Alumni Center on Thursday. UCF Board of Trustees decides to let the interim president lead until the appointment of a permanent one, and approves a $600K settlement with former president, Dale Whittaker, in a meeting Thursday. In front of a crowd of over 100 people in the FAIRWINDS Alumni Center, the BOT agreed unanimous to extend Thad Seymour Jr.’s role until a permanent president is named next year. The decision is subject to approval by the Board of Governors, which is expected to decide on it in it’s March 28 meeting. BOT Chairman Robert Garvy said this extension will help UCF focus on appointing a new permanent president, which the BOT would like to start the search for this fall. Seymour said he appreciated their vote of confidence and that he is ready to lead UCF during this transition phase. The BOT also unanimously approved a one-time $600K settlement with Whittaker to avoid possible litigation, since he has the right to ask for his full tenure of $3.2 million, Garvy said. Garvy said the Board of Governors is “close” to completing its report on UCF’s misspending of funds on construction projects and expects they will discuss this at their next meeting on March 28. The Board decided to suspend a total of $330K in payments to former President John C. Hitt, “which will cover the extent of his participation in the performance payment plan,” Garvy said. “This action was taken based on findings of the Bryan Cave investigation and the House Committee’s report that President Hitt played a key role in the decisions to use state operating dollars to build Trevor Colbourn Hall,” Garvy said.